The Summer Hoops Festival wrapped up today and by any measure you want to use it was a tremendous success. A large contingent of coaches stayed on to watch, looking to let the recruit they have been following since April know of their serious interest or to find a “diamond in the rough” that could help elevate their program. The EYBL’s New York Lightning played two contests today and their second one against the Florida Sons out of the Adidas Gauntlet circuit had the gym buzzing. The Sons led 36-33 at the half and extended that lead to near double-digits in the second period. The Lightning continued to play with that legendary NYC toughness and with just under two minutes to play had whittled the deficit down to a single point at 60-59. The Sons could have attempted to hold the ball and force the Lightning to foul but that isn’t in their DNA to do so. A Lightning player drove to the basket, hoping for points, a foul, or both. Despite contact, he got none of those. The Sons grabbed the rebound and went the other way, making it a three-point game with 1:20 to play. The Lightning attempted to answer quickly but the Sons were ready. They missed their shot attempt and the Sons rebounded. The Lightning pressured the ball, trying to force a turnover, but the Sons were able to handle it and scored a basket inside, making it a two- possession game with around 45 seconds to play. The Lightning backed off, realizing there was really no need to extend the contest and the Sons went on to win by the score of 64-59. While his point total didn’t crack double-digits (six for the game), 6’9 rising junior Kuany Kuany of the Florida Sons impacted the game in so many other ways. Four of his points came early in the contest, sparking the team to an early lead. Defensively he was active on the boards at both ends and used his length to challenge shots both on the inside and on the perimeter. Midway thru the first half, it looked like he might be done after rolling an ankle. Clearly limping and grimacing in pain, he continued to play on for the next couple of minutes until a stoppage in play. He attempted to walk it off by the bench but the ankle was clearly bothering him. Kuany continued to play in the second half, clearly not 100%. Still, on back-to-back plays he dove on the floor to secure a loose ball and then took a charge. That inspired his team as the Lightning made a run. Kuany offsets his thin build with a solid skill set that allows him to use his size to an advantage on the perimeter. No doubt many coaches from the mid-major level on up took interest in his play this week. The last session of the event (#35 if you count such things) would have been easy to cast aside. 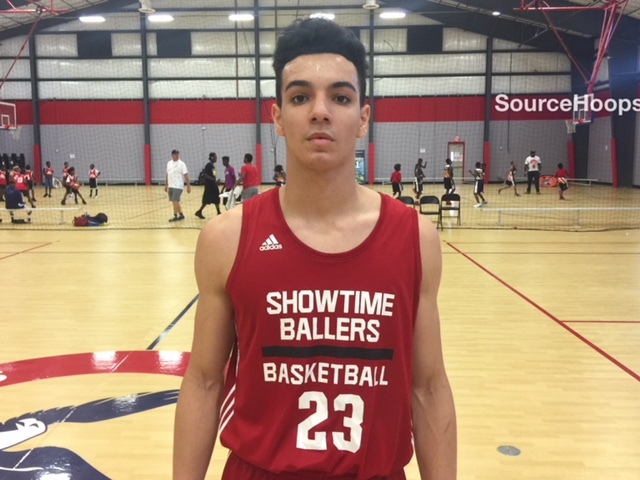 However, we are very glad we didn’t as we got a chance to check out Gianfranco Garfolo of Showtime Ballers Select. The 6’2 rising senior from Fleming Island outside of Jacksonville came to the states as a result of Hurricane Irma. He made us sit up and take notice after he put down a dunk in transition. He followed that up with a couple of jumpers, some rebounds which he quickly outletted that turned into points, and some slick passes in the half-court. By the half, he had sixteen points. The second half was much the same and the opposing team took to face guarding him so that he couldn’t get the ball and make plays as easily as before. He may not “wow” on the athletic charts, but Garfolo’s skill set and basketball savvy make up for it. Dominick Denny, a 5’10 point guard in the 2020 Class playing up a year for South Florida Elite, played well in the first game of the day at 9AM. He proved to be solid with the ball, quick to get into the lane, and finished in traffic at the basket. Denny only shot one jump shot on the day (off the dribble from mid-range), but he has good form on his shot and it certainly seems like he should be a capable shooter from three point distance. Denny put in a solid effort on the defensive end and though a bit on the small side, he plays with tremendous heart and doesn’t back down from a challenge.